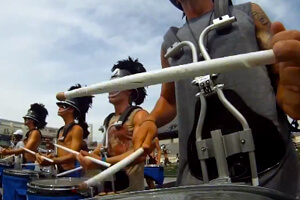 Ride along with some of the top drum corps of Marching Music's Major League! DCI's "Drum Cam" puts you in the performer's driver's seat, bringing you closer to the action than you've ever been before. In this first episode featuring last summer's corps, check out every intricate detail of the Bluecoats drum line who took second place in the percussion caption at the 2012 DCI World Championship Finals.